NEW YORK, NY--(Marketwire - August 27, 2010) - In a Modern Love twist relying on technology and online Facebook votes, The Today Show's wedding event is in full cyber swing. Diamonds For A Cure® by Neda Behnam is one of four prestigious jewelry designers selected by NBC's The Today Show to take part in the network's live, on-air annual wedding event, providing bridal rings to one lucky couple. Finalists Melissa and Jeremy now await the public's voting selection. Over the next 4 days the general public is invited to cast its votes online on TODAY's website and Facebook, choosing from Diamonds For A Cure by Neda Behnam, Neil Lane, Brilliant Earth, and Asprey. The designer to receive the most votes will provide the wedding bands to the lucky couple for their September 30 nuptials. 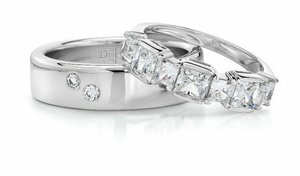 Presented for voting from Neda Behnam's Diamonds For A Cure (DFAC)® bridal collection is a handcrafted woman's platinum band with seven princess-cut diamonds and a man's handcrafted, platinum, comfort fit band with two round diamonds. Interestingly, DFAC donates a portion of all jewelry sales to cancer research. "As a designer and the CEO of Diamonds For A Cure," said Behnam, "I am thrilled to have been selected. Being showcased alongside historical and internationally known brands presents a wonderful opportunity for DFAC, which is a relatively new jewelry brand," added Behnam. Does she think she will be chosen? "For me it is more about giving back," said Behnam. "While I am pleased to support this wonderful young couple, at the same time my heart directs me to do all that I can to save lives by supporting cancer research. This promotion has already enabled me to reach out to nearly five million viewers with the DFAC message of supporting a cause. To me, this is what it's all about. This is a great event. The jewelry is beautiful, but ultimately it's all about a great cause," added Behnam. Neda Behnam, founder of Diamonds For A Cure, is an award-winning expert goldsmith with over 30 years' experience. She is also a breast cancer survivor who uses her exceptional talent to craft unique diamond jewelry for a cause. A percentage of all DFAC sales go to the philanthropic organization Stand Up to Cancer®. An active voice for a cure, Behnam believes "diamonds are precious, so is life."